The VP3610 USB Notebook Audio Station is the ideal accessory for setting up your notebook computer on the desktop. A seamlessly integrated stereo speaker delivers powerful audio performance. A built-in 3-port USB 2.0 high-speed hub provides ideal connectivity for USB devices such as keyboard, mouse and printer. The supplied AC adapter offers smooth operations for USB accessories with high power requirement. 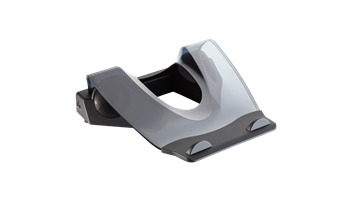 The stand provides a raised angle elevating the notebook monitor screen to reduce eye strain. All these features and functions are connected to the computer via one single USB cable. The USB audio station is plug-and-play without the need for software drivers. Overall Dimensions: 13" x 12.2" x 4"